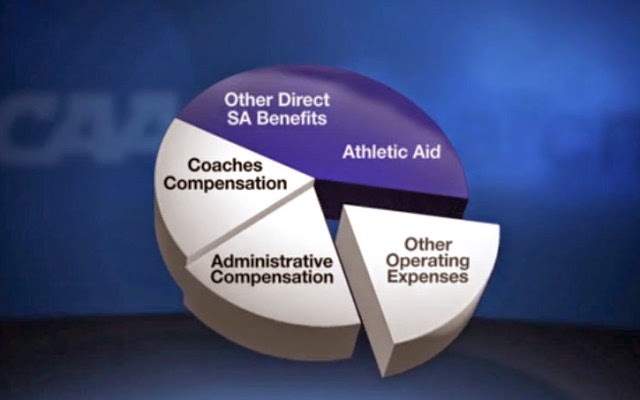 The NCAA's claim about the money that goes to student athletes doesn't add up. The embedded link directs to the association’s financial “about us” webpage, which makes the same 90 cents-plus claim. And that sounds wonderful. Charitable. Downright magnanimous. Certainly reason to reject the share-the-wealth arguments of those greedy O’Bannon lawsuit plaintiffs and union-agitatin’ Northwestern University football players and whoever picks the cover stories for Time magazine. To borrow from Patrick Ewing’s long-ago NBA lockout logic: Sure, the NCAA and its member schools make a lot of money off athletes. But they spend a lot of money on athletes, too. Over 90 percent of the total take. DYK, y’all! Thing is, the 90 percent support claim is the product of creative accounting. And by “creative,” I mean the bookkeeping equivalent of duct-taping a waffle cone to a donkey’s forehead, then claiming you’ve discovered a real-life unicorn. According to USA TODAY Sports, the NCAA took in nearly $872 million in revenue in the 2012 fiscal year, mostly from television and marketing rights. About $504 million of that was distributed to member schools and conferences; another $115 million was spent on association-wide programs; more than $38 million went to management and general spending; and the organization reported a $72 million surplus. Add $504 and $115 million and guess what? You’re only at 71 percent of total NCAA revenue generated — which last I checked, is less than 90 percent. Still, let’s assume that the association is telling a half-truth, and that 90 percent of its revenue does go to schools. Does all of that money actually support college athletes? When Northwestern football players are bussed to a road game instead of having to buy their own Greyhound tickets and/or carpool and front gas money, that’s a benefit. When Jim Harbaugh builds a $70,000 office bathroom while coaching Stanford University football, that’s a benefit. When the University of Oklahoma employs compliance officers to police the precise amount of gratis pasta eaten by players at a graduation banquet, that’s a benefit. Needless to say, the 90 cents claim is absurd. As is the logic behind it. Without doubt, the NCAA and its member schools spend a lot of money to support college athletes — but they also spend just as much, if not more, to support the entire gold-plated edifice of college athletics. The two are not the same, any more than your office installing ergonomic desks and a higher-speed Internet connection is the same as getting more vacation days or a bump in your paycheck. For the NCAA to boast otherwise is disingenuous. Wait. Approximately half? What happened to over 90 cents of every dollar generated? Oh. Right. But wait! By the NCAA’s ever-shifting standards, most of that counts, too. Like amateurism itself, spending on college athletes is whatever the association says it is, and a depressing reminder of the real golden rule: Those who have the gold, rule.